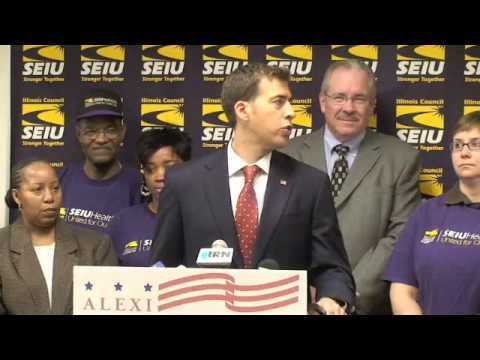 Illinois' largest union, the Service Employees International Union, will announce Thursday it is backing Democratic front-runner Alexi Giannoulias for U.S. Senate. Giannoulias threw himself into the fights to keep open the Hartmarx factory in suburban Des Plaines and the Republic Windows factory in Chicago, in both cases using the power of his Illinois State Treasurer's office to pressure employers to keep union jobs here, the union notes. Rival Democrat Cheryle Robinson Jackson, president of Chicago's Urban League, last week got the backing of EMILY's List, a national pro-abortion rights group. Former City of Chicago Inspector General David Hoffman is also in the race.